Sometimes referred to as cable grips or cable stockings, cable socks are an efficient way of pulling cables. The T&D range of cable socks have either single or double eye for attaching to the pulling rope. 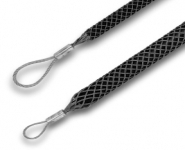 Lace up type cable stockings are also available for fitting at midpoint along the cable length. The standard range covers all cables from 6mm to 130mm overall diameter. Special length, diameter or muti-leg (triplex) cable socks also available. LV-HV cables are generally installed in accordance with ENA-TS 09-2 "The Specification for the Supply, Delivery and Installation of Power Cables with operating voltages on the range 33kV to 400kV and associated auxiliary cables" except where it conflicts with the cable pulling requirements of ENA-ER C.82 - "Pulling in 11kV Aluminium Sheathed, Consac and Waveform Cables" and in accordance with the cable manufacturer recommendations. Single Eye Cable Socks - cable socks ideal for pulling medium to heavy loads, the cable pull can only be achieved from the cable end. Double Eye Cable Socks - cable socks suitable for pulling medium to heavy loads, the main advantage compared to the single eye cable sock is that the cable can be passed through the sock thus enabling the cable pull to be made at various stages down the cable. Lace-Up Cable Socks - similar to double eye cable socks but the sock is positioned on the cable then stitched together, this is particularly useful when the cable pull is somewhere down the cable or when there is a connector on the cable end. Open Ended Cable Socks - ideal for jointing 2 cables and mainly used by cable pulling contractors when an old cable is being replaced with new. Non-Conductive Cable Socks - cable socks for use in water, fibre optic, offshore or LV-HV cable laying projects.